Serendipitously following my review of Putain des Palaces today, rebellious perfume punks Etat Libre d’Orange have announced the launch of their latest fragrance entitled, ‘True Lust Rayon Violet de ses Yeux‘. Launching 01 February online at Etat Libre d’Orange, True Lust is a blend of two popular fragrances within the brand’s collection, namely Dangerous Complicity, and the aforementioned Putain des Palaces. Bearing the tagline “the reality of love”, the fragrance is described as a “sweet and shocking folly”. This launch comes hot on the heels of Etat Libre d’Orange’s big shift in direction, which saw them launch their first Cologne (and it really was a cologne) as well as their first flanker (Rien Intense Incense). All of which came after the brand launched a fragrance called La Fin du Monde (The End of the World) and stated that they may start doing things a little bit differently. Who knows what will be next? But for now, further details on True Lust are below the jump. Rum JE, Ginger JE, Rose Absolute, Violet, Coconut JE, Osmanthus Absolute, Lily of the Valley, Jasmine, Ylang Ylang, Tangerine, Rice Powder, Amber, Leather, Animal notes and Sandalwood. 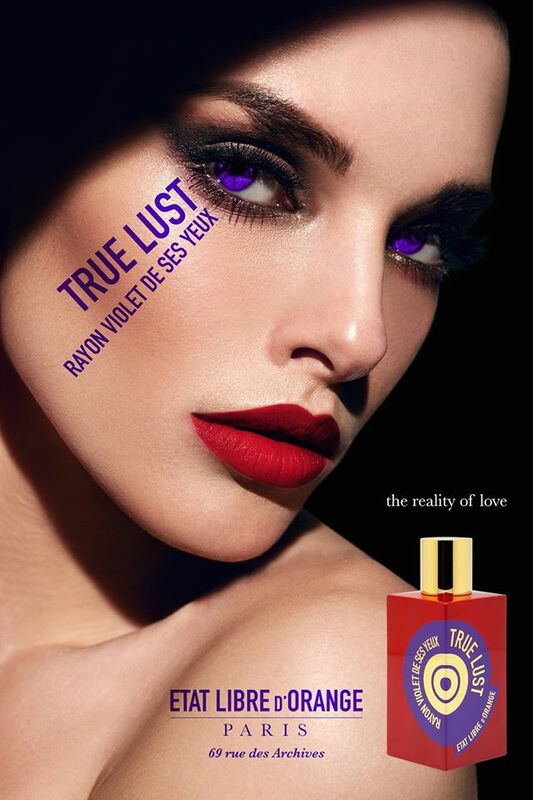 True Lust Rayon Violet de ses Yeux will be available online at Etat Libre d’Orange in 100ml Eau de Parfum. Posted in Etat Libre d'Orange, Smelly News and tagged Dangerous Complicity, Etat Libre d'Orange, New Fragrance, New Launch, New Perfume, Putain des Palaces, Smelly News, True Lust Rayon Violet de ses Yeux. Bookmark the permalink. Think a possible trend for 2015 could be hybrids/mergers of two or more scents. 4160 Tuesdays has done it successfully with Tart’s Knicker Drawer and going back not far off 90 years ago Wallis Simpson was mixing Mitsouko and L’Heure Bleue together. I remember in my 20s trying to do the same with Vol de Nuit and Jicky to perhaps not the same effect. More successful is my recent cocktail of 2/3 Shazam and 1/3 Dark Heart of Old Havana which I’ve affectionately christened Shavana. Sarah certainly started the trend. I love Tart’s Knicker Drawer. It’s in my ‘to review’ pile and I bought my mother a bottle for Christmas. Great stuff. I got all excited for a second there. I love PdP but Dangerous Complicity was a weak, fleeting little thing on me. I hope this has the best of both in it. I agree. Dangerous Complicity didn’t wow me. I like it as jammy osmanthus-scents go, but it’s nothing particularly unique. And since I spent my holiday reading a biography of Richard Burton and Elizabeth Taylor’s love affair, I am just in the mood to fall in love with violet eyes. It’s an intriguing concept and I can see how Putain des Palaces and Dangerous Complicity would go together. We shall see how it turns out!